Bainbridge Island resident Ed Viesturs is one of the world's premier high-altitude mountaineers. He is the first American and 12th person overall to summit all fourteen mountains over 8000 meters and the sixth climber to do so without bottled oxygen. 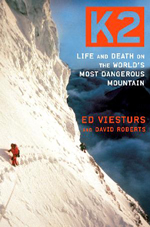 Viesturs has also summitted Mount Everest six times, a feat surpassed by few people. Many of his mountain adventures have made it into book format. Viesturs' Himalayan Quest: Ed Viesturs on the 8,000-Meter Giants (2003) is replete with magnificent photographs from his expeditions on the 12 tallest mountains in the world. No Shortcuts to the Top: Climbing the World's 14 Highest Peaks (2007) is described by Booklist as a "compelling story of dedication, desperation, danger, derring-do, and devotion (physical and spiritual). 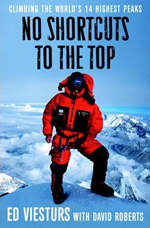 Fans of extreme-sport books, especially tales of high adventure, will want to add this one to their collections." 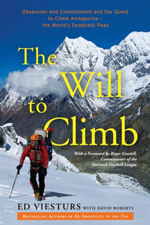 Viesturs' latest books are K2: Life and Death on the World's Most Dangerous Mountain (2010) and The Will to Climb: Obsession and Commitment and the Quest to Climb Annapurna--the World's Deadliest Peak (2011). When not climbing or writing, Ed Viesturs is a motivational speaker who uses his climbing experience to inspire and teach team work. For more information go to http://en.wikipedia.org/wiki/Ed_Viesturs or check http://www.edviesturs.com/.